Saturday. There would be blood, sweat, and zombie tears. 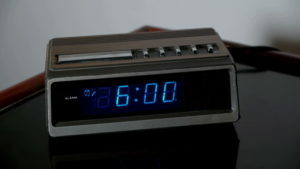 Who invented 6 o’clock anyways? 6 am. Too early. Snooze until 7. Kevin and I headed down to breakfast in the hotel, and walked to the Convention Center, arriving in front of the door adjacent to the USAopoly booth. We were the fifth and sixth person there. There would be two lines at the booth – one to buy the expansion, one to acquire promo cards by demoing the game. We greeted the other early risers, introducing ourselves as either expansion or demo runners. It was surprisingly cordial, as if we were all united in one purpose. We had a camaraderie that only comes from spending hours waiting to buy a board game outside a convention door. Rock Me Archimedes in its fulcrum-controlling glory. During the two hour wait for the doors to open, Kevin introduced me to Rock Me Archimedes, an abstract strategy games from the now defunct Marbles, The Brain Brain Store (2012). The game consists of a playing board with holes for marbles, all balanced on a wooden fulcrum. The goal is to move four of your colored marbles to your endzone at the extreme edge of the board from the middle start segment. 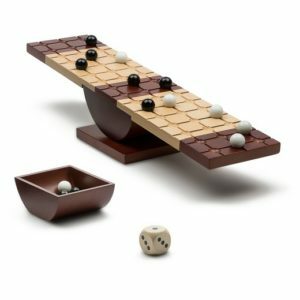 However, your placements must take balancing into careful consideration, because if you cause the board to touch the ground, you lose. The game was fun, and definitely attracted attention. However, there is a strategy that can cause an impossible-to-solve stalemate, which we purposefully avoided, but it is not a perfect game. I still highly recommend it for a quick abstract strategy game. I think this game would benefit from chess timers or a similar feature, which would push suboptimal moves and increase the likelihood of unbalancing the board. 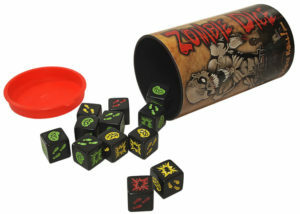 After an hour or so, we switched to the incredibly quick and light game Zombie Dice from Steve Jackson Games (2010). The game is a Yahtzee-style push-your-luck dice roller where you are trying to collect thirteen brains before too many survivors hit you with shotgun shots. We played through a few games, including some of our fellow early risers (shout-out to Abbey!). I lost. Over and over again. But it was still a fun filler game. By now, the crowd had increased greatly in size, amping the tension and anxiety. We packed up and waited. A convention staff worker came out and told us all not to run, blah, blah, blah…and go! We were through the doors and separated, Kevin headed right and I headed left. I followed the sign for Store Line (rookie mistake), and ended up about ten people behind those who ignored the signs and went straight for the store. Within minutes I had my expansion and promo cards in hand and Kevin had managed to get into a demo game. With almost an hour until my first scheduled event, I had a little time to demo games. Because I like to torture myself with things I cannot have, I went to the CMON booth. I did not expect to like this. Buying it would prove fortuitous indeed. 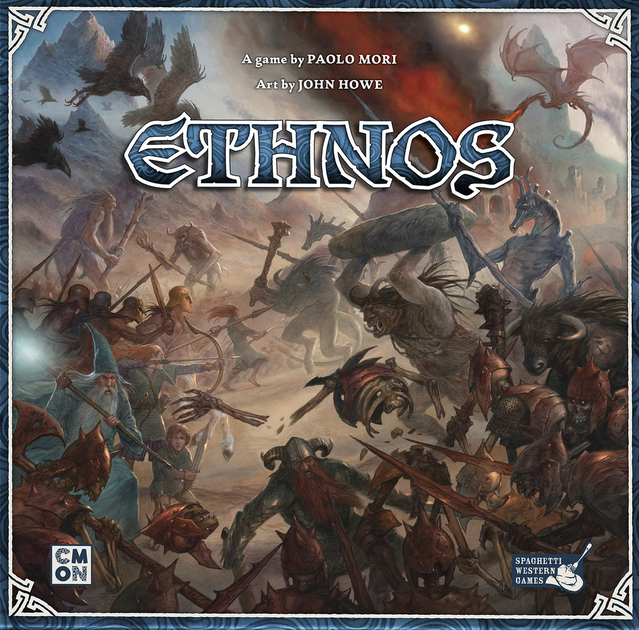 I sat down at a table to demo Ethnos, CMON’s brand new release set collection/territory control game. There had some rumblings of hype surrounding Ethnos but I have a history of disliking set collection games. It. Was. EXCELLENT. The game is a fast-moving game where you either play bands (sets) of certain tribes or bands based on one of five/six colors, allowing you to place a marker on the board based on the color of the top card. You only get to play a marker if the size of your set is larger than the number of markers you have placed, making it progressively harder to grow your control of specific territories.The top card on your band has a special effect, based on tribe. They can draw you cards, get you extra marker placement, help with endgame scoring, and a number of other effects. The game exceeded the hype. Games go quickly – all three ages with four people takes less than an hour. Scoring is based on territory control, size of sets, and the various powers of different tribes. I immediately moved to the CMON store to buy this game. 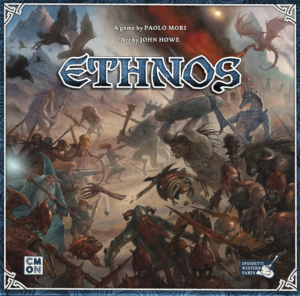 As I purchased Ethnos, the kind woman at the register handed me a ticket for spending at least twenty-five dollars, explaining that it could be used to pick up previous Kickstarter exclusive items at a different part of the CMON booth. What!? 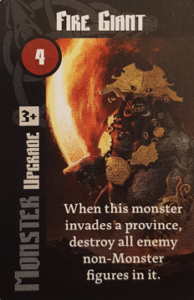 I immediately ran over to see the rate on the only items that really mattered – the Blood Rage Kickstarter exclusive monsters. The Mystic Troll, Fenrir, Mountain Giant, and alternate sculpts of the Ram Clan fifth player expansion. Three of the four Kickstarter monsters were there! But each cost two tickets . I had one. You could get one ticket per every twenty-five dollars you spent. My phone vibrated as I started quickly doing mental arithmetic. My event! I declared I would be back (hopefully) in my head and started moving. I wanted to like you better. 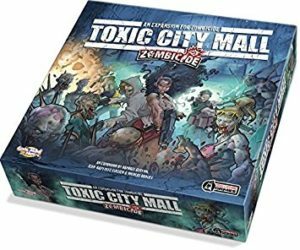 I ran walked quickly through the Exhibit Hall out to large gaming Hall to play Zombicide: Toxic City Mall. I have never played Zombicide, and with the recent push of Zombicide: Green Horde on KickStarter, I had thought I would try it. The game is a cooperative, dice rolling, fighting/resource management game. You play one of a suite of characters with variable player powers, and acquire various materials and weapons to fight the zombies. In our particular scenario, we also needed to find specific items, one per player, then all rendezvous at the helicopter. We found weapons, shot zombies, found parts, and found our items. As you kill more zombies, the game has a built-in mechanic that makes it harder. We hit the red, dooming one player. However, their death allowed the rest of us to win. If you like rolling dice and really like zombies, you will like Zombicide. I was not particularly impressed. The game takes an incredibly long time to teach and set up for relatively simplistic gameplay and decision-making. I can see its appeal to a certain demographic of gamer, I am just not part of that demographic. Unless moved by some outside force, I will not try Zombicide again. Two out of four monsters down in one go. We finished slightly early, allowing me time to go back into the Exhibit Hall. 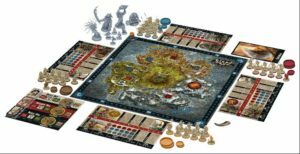 I went back into the CMON booth, looking at the chart for $75. Eric Lang’s new The Godfather: Corleone’s Empire was $80. I purchased the game, then moved over with my three tickets to the Exclusives booth. I had four tickets now – enough for either two monsters or the Fifth Player Expansion sculpts. I asked the booth worker for advice, and became the owner of Fenrir and the Mountain Giant! One half of the Exclusive monsters acquired. My goal was half-accomplished and I set out with a smile on my face through the Hall. 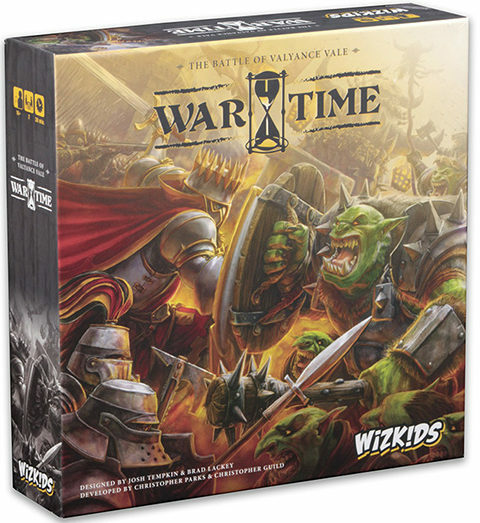 War Time: The Battle of Valyance Vale has a cool gimmick, but fails to offer a more engaging experience for its price tag. The unexpectedly long break gave me my first opportunity to see some of the games on my list in the Exhibit Hall before it closed. 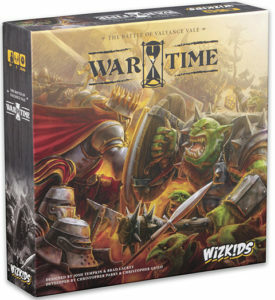 First I stopped by WizKids to check out the new release of War Time: The Battle of Valyance Vale. This game is a real time skirmish game on a hexagonal board. Units can be moved or attack, but then you assign one of several sand timers to them – thirty, sixty, and ninety seconds in this case. You can move and take actions with that piece when the sand timer runs out. The pieces are actually just card board circles that slide down plastic holders, allowing for modular battles and different strengths of similar units. While the sand timers were a nice touch, it remains a very basic skirmish game that did not seem to have much depth. I exited stage right without making the $65 purchase, though that demoer should be complimented for his speed and clarity. Sold out every day. Can the game live up to the hype? I met up with Will to grab lunch. 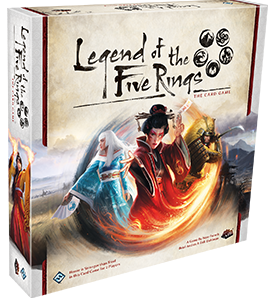 As he explained how happy he was to have acquired a copy of the much-hyped Legend of the Five Rings: The Card Game, the new LCG from Fantasy Flight Games. His review is very positive, I will be posting mine whenever we have a chance to sit down to play. Blood Boiling. Heart pumping. Rage inducing. The competition for Ragnarok. As we talked I remember a key detail of the day – I had time to enter the Blood Rage tournament! Originally, my schedule overlapped the tournament, but now I could go. I grabbed my Island Noodles (my Con food truck/stand/vegetable source of choice) and ran back into the gaming hall. I found the CMON tables and had my two generics ready. Three other people had arrived before me. A tournament for sixteen players that cost two event tickets that had been sold out since day one of event registration. My odds were low. My first stroke of luck – after fifteen minutes half the players did not show up. I was in! The prizes sat at the end of the table, in particular, the Wolfman was for the number one player as it was not available at the booth for ticket redemption. First, second, and third place would all get exclusives, either the Wolfman, Mystic Troll, or Fenrir. I took my seat at a table, said “hello” to my opponents, assembled my Serpent Clan pieces, and was ready to go. Blood Rage is a card drafting territory control game. You play through three ages, with a progressively smaller board with progressively more powerful cards. I started with one of the best cards in the game as my first pick – Frigga’s Charm, an auspicious start. Throughout the ages I summoned a Sea Monster and a Dwarf Chieftan and completed quests. One of my opponents was using the Loki Strategy of losing combat on purpose to gain glory/victory points (coward), while the other was trying to gain glory by winning combat. I tried to scrape together a strategy, falling far behind in the second age. I love seeing that board. But the third age was different. I acquired cards that allowed me to win combats, and made my leader much more powerful at raising my clan stats. I found a way to take over the region that would be the focus of Ragnarok at the end of the game. I also acquired several cards that allowed me to gain points for having my pieces die. The game ended, and it was only clear during endgame scoring that I had won – by two points! I had 152 points, a personal best. We learned that the tournament was Swiss based on cumulative score, and that both of the top two players from our game were in the finals. We wished each other luck and headed into the final round at the top table of four. In this game, I was able to draft a strategy of board control. I had free or cheap ways to summon figures to the board and I had good combat cards, followed with a few quests. I started falling behind every player. My hopes were fading. I picked up my second age cards, finding myself in a similar position. However, I was able to pick up a key cards guaranteeing my victory in combat along with several monsters, including the Fire Giant. I was able to set up the board in such a way to block several people from finishing quests (one by blowing away all of his figures with the Fire Giant at the end of the age), keeping their clan stats in check and boosting my own by pillaging throughout the age. The third age loomed, it was now anyone’s game. The first card I took was Eternal dragons, 12 points for when my boat died. 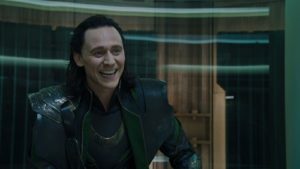 Then I was passed the best Loki card – it gave three glory for each figure that you released from Valhalla at the end of the game. Then the quest that rewarded you for dead figures with three glory each. The rest were combat cards. I needed to end the age quickly to prevent my opponents from gaining too many points, but I needed my figures to die for points. This was going to be…complicated. Good thing I identify with one particular character. I started out the age on my first turn by pillaging Yggdrasil. It is a single region worth one of every clan stat – the most valuable region. As I heard my opponents groan, I knew it was mine. I then aggressively took regions, invading, and pillaging to boost my clan stats. All but one of my clan stats were boosted to full. I just needed to finish my quest. However, another player had managed to lock out all but my ship from the Ragnarok region. I had three figures in Valhalla. After questing and stopping other players from raising their clan stats, I unsuccessfully tried to pillage the region. I gained 12 points from the boat dying, and now had a completed a secret quest. We ended the age, first revealing quests. I had completely blocked one player from finishing any quests, another had none. I had finished mine, adding 11 points and the last clan stat. But then the fourth player revealed his quest cards. They almost all relied on the region he had taken over and blocked me out of during the age. He had played a card that doubled the glory he gained from each quest. He propelled himself far ahead on the glory track. We then performed Ragnarok, propelling him even further ahead. 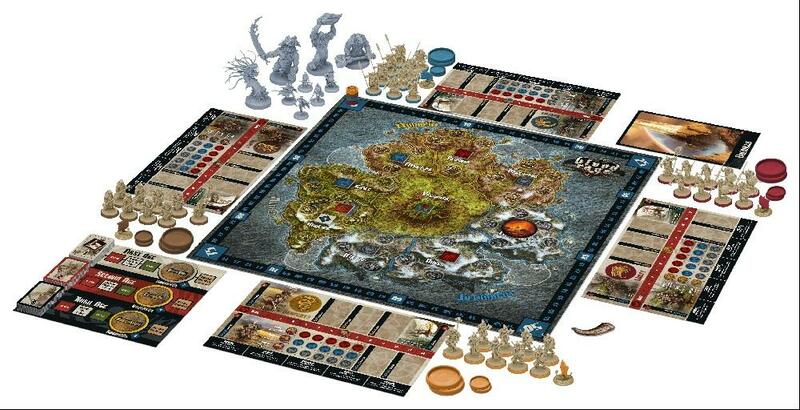 However, during the release from Valhalla, I gained 12 points for my four figures. Then I gained sixty points due to clan stats – the maximum amount possible. Additionally, I had successful prevented anyone else from achieving full clan stats. I was clearly in the lead after the first and second player checked. The last player slowly added his clan stat bonuses to land four spaces in front of me, my heart fell. 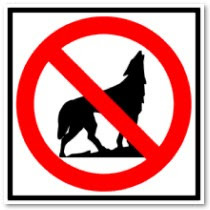 Had I just lost my only chance at acquiring the Wolfman? Had I lost my one chance at gaining the most difficult to find Kickstarter exclusive for my favorite game? The last place player was announced first – a man so far behind in points it was ridiculous, but his enthusiasm for the game moved the man running the event to give him the Wolfman. I understand kindness, but I wanted that mini! 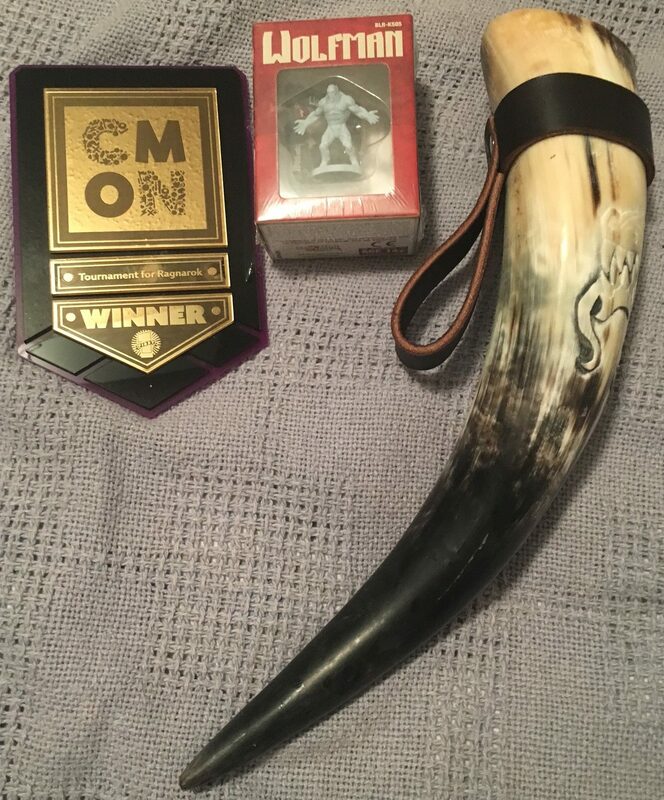 Third place was announced, Fenrir was passed off, a plaque, and a $10 coupon to the CMON booth. Second place was announced, the Mystic troll disappeared, a plaque, and a $25 coupon. First place was announced as…Alex! Me! I had been so distracted by losing the game that I hadn’t realized just how many point I had scored – 162 points in the finals, making my cumulative total more ten points ahead of second place. 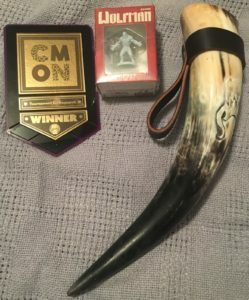 One Viking Horn drinking horn, a $50 coupon, and a first place plaque were handed to me. However, there was one thing I wanted. As I gathered my courage, the third place finisher asked to switch his mini for one of the Wolfman Minis. The event runner agreed and did it. I faced down my inner introvert, and took my chance. The guy look exasperated, but asked the woman who was clearly in charge of all CMON events. “Did he win the tournament?” she asked in a business-like manner. They handed me the Wolfman and I went merrily on my way before they changed their minds. The third and most difficult to acquired mini was now in my possession. Winner, winner, chicken dinner. Three out of four monsters acquired. I headed over to Steve Jackson Games to meet up with Kevin and play in the Zombie Dice survivor tournament. Groups of five played one game each, with the five winners playing one game. It was a fast tournament. I was out in the first round. Kevin made it to the top table, but only rolled three brains the entire game. I didn’t care. I was on Cloud 9. I had won a tournament of my favorite game, I had acquired almost everything I had hoped to at this GenCon. The meetup offered too little to the average participant. We regrouped with Will and set out to the Secret Cabal Meetup, in the hopes of winning the raffle. The line was insane! It went down the street, then around the block, then down another whole block. When things started moving we got our raffle tickets, failed to get beer, then headed out to the street for the call out. None of us won. Too many people, too little chance of winning. I had no chance to talk to the various podcasters either. I probably won’t be back next year for that event. We headed back to the hotel where I introduced Kevin to Ethnos and was soundly defeated. We decided that we would rush the hall again so I could use my coupon to get another CMON game worth $50, worth two tickets, and pick up my last mini. Kevin headed to bed while I loitered with Jason and Marty for an hour reviewing our exploits. Jason had enjoyed his DCC experiences, and didn’t seem very keen to leave them. Marty finally found fun! All it took was a dinosaur time-travel RPG. You can read his writeup when he gets to it. Will had played his Armada and X-Wing tournaments. He was now fully invested in Fantasy Flight tournaments with his L5R purchase. Sunday would be an interesting day. 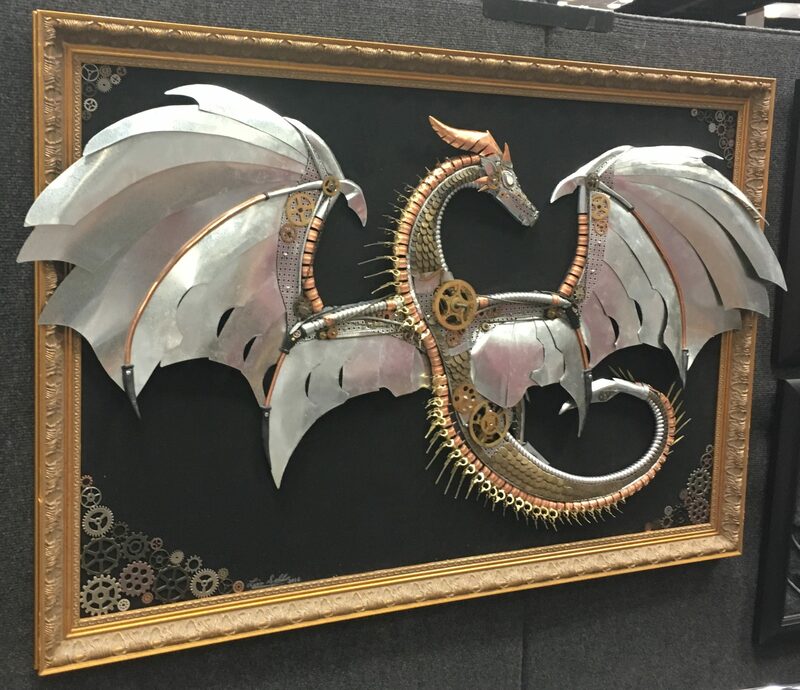 It was time to see the Exhibit Hall for me – and learn about the true meaning of art. 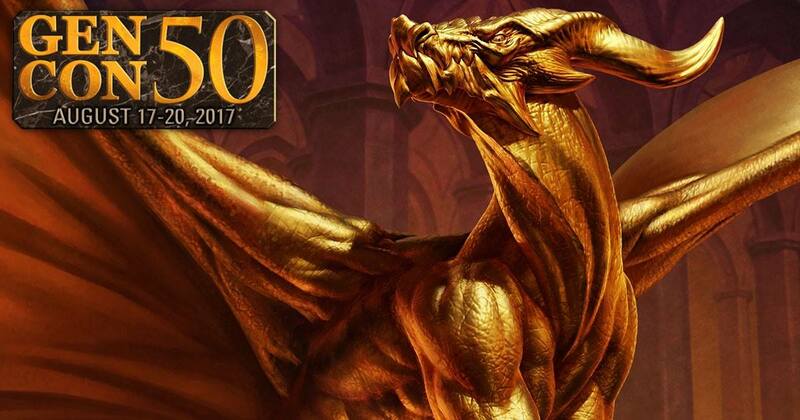 TL;DR Rock Me Archimedes, Zombie Dice, Ethnos, Harry Potter expansions, Blood Rage, and Kickstarter exclusives are great. Secret Cabal meetups, Zombicide, and early mornings are bad.